Mark Farren with his wife Terri Louise. Former Glenavon footballer Mark Farren is fighting for his life and needs your help to get special treatment which offers him the best chance of saving or at least prolonging his life. A special fund raising match hasbeen arranged for Thursday night at Mourneview Park between Glenavon and a Derry City XI which features his former teammates from Derry City’s memorable UEFA Cup campaign in the 2006/7 season when they defeated IFK Gothenburg and SPL side Gretna to qualify for the first round proper, drawing 0-0 with PSG at the Brandywell before losing 2-0 in Paris. At the weekend Mark’s family appealed for financial help. Potentially life-saving treatment is available at clinics in Germany and Mexico but it will come at a significant cost. In his most recent operation, surgeons removed over 80 per cent of a brain tumour but his speech and mobility have been affected and a biopsy following that surgery indicated the tumour was highly aggressive. After becoming Derry’s record goal-scorer with 113 goals in 2012 Mark joined Glenavon in 2013 and was named the Irish League’s player of the month in April 2013, but had to stop playing later that year in order to undergo more surgery. “He’s a nice, quiet fella. We offer all the support we can.” said Glenavon chairman Adrian Teer. 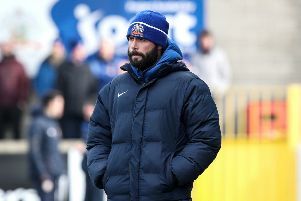 Glenavon manager Gary Hamilton said, “I appeal to every football fan to come and support this game. Cancer is a terrible disease and you don’t want to see anyone getting it. “As a family at Glenavon Football Club I want us to support this because Mark was a big player in getting us into the next level. If Mark Farren was with this club now we would have challenged for the league title. Mark and his wife Terri-Louise have been overwhelmed by the support so far.